This week it is very good to be a woman who likes comic books. Or comic book movies. Or novels based on comic books. Basically, it's really good to be a woman this week. Why? First, the BIG one. DC has officially announced a stand-alone Wonder Woman movie for 2017. For real. Officially. Starring Gal Gadot. Excuse me, I am having trouble breathing. What is air? This comes as big news, of course, because DC's been waffling about whether or not to even bother trying to do a Wonder Woman movie for years now, and this announcement is totally out of the blue and just... Way, way more than I ever expected. There will be a Wonder Woman movie in my lifetime. Hrrrrrgh. Also they announced a Jason Momoa lead Aquaman movie, and that's pretty cool too. I think he might be the first non-white person to get his own standalone superhero franchise. So that is super rad. Good on you, DC. For once I am happy with you. It feels weird, but it's true. At New York Comicon this weekend, Marvel announced that it was adding a whole slew of new female-led titles to its comics roster. After the amazing success of Edge of the Spiderverse #2, which featured "Spider-Gwen", an alternate reality where Gwen Stacy was bitten by a radioactive spider and became a superhero who also happened to play the drums in an all girl punk band, Marvel has decided to use that comic as the start of a whole new series. 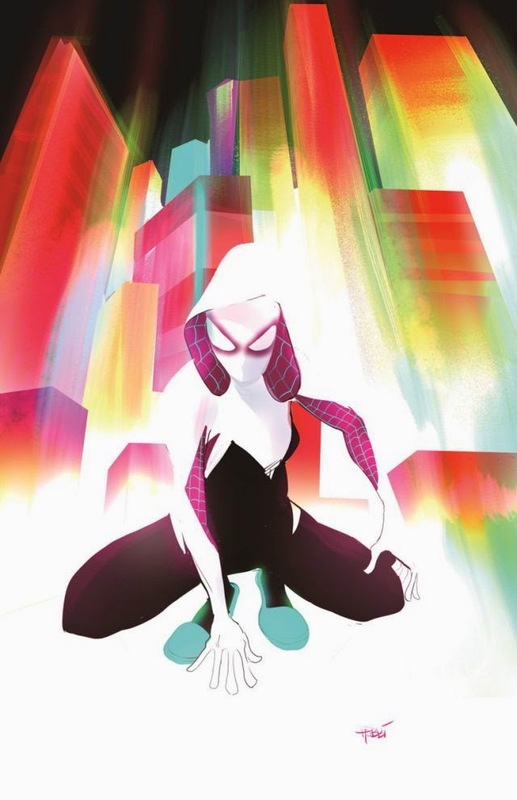 Starting in January, we're going to get a full monthly comic devoted to Spider-Gwen. Even better? She will still be the drummer of The MaryJanes, and still be best friends with MJ. Yessss. 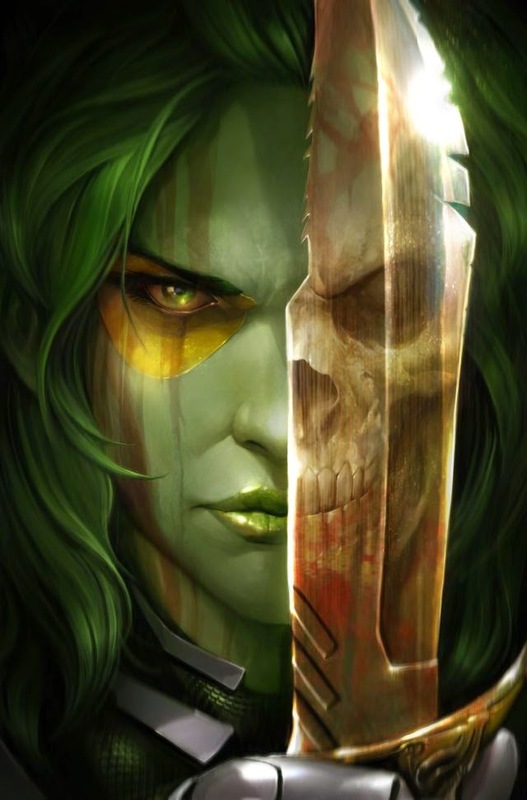 Marvel also announced that alongside their already running solo comics for Peter Quill and Rocket, after the blockbuster success of Guardians of the Galaxy, Gamora is getting her own solo comic. Yay! It's reportedly going to get more in depth with her motivations in getting revenge on her "father" Thanos, will delve into her relationships with the other children of Thanos, and will feature lots of good old space adventuring assassin fun. Black Widow might not be getting a movie yet, but she is getting her own young adult novel, following in the footsteps of She-Hulk and Rogue. I'll admit that I haven't yet read either of those novels (but I have the She-Hulk one on hold at my local library). Still, the book will be written by Margaret Stohl, who wrote the bestselling Beautiful Creatures series. So I'm pretty excited. And yeah, the list keeps going. Peggy Carter isn't just getting her own show this winter with Agent Carter, she's also getting a solo comic: Original S.I.N. Well, I suppose it's technically not a solo comic, since she'll be sharing it with Howard Stark (the Dominic Cooper version), but still. Peggy and Howard fighting Nazis and all that cool stuff. It's meant to be a leadup to the actual premiere of Agent Carter, but I bet if we really try we can get it to be an ongoing. I mean, come on. We're ladies with a lot of purchasing power here. It's going to be written by Kathryn Immonen, who might not sound familiar, but should. She's the woman who wrote the spectacular Agent Carter one-shot that got this whole Peggy Carter ball rolling. All hail! 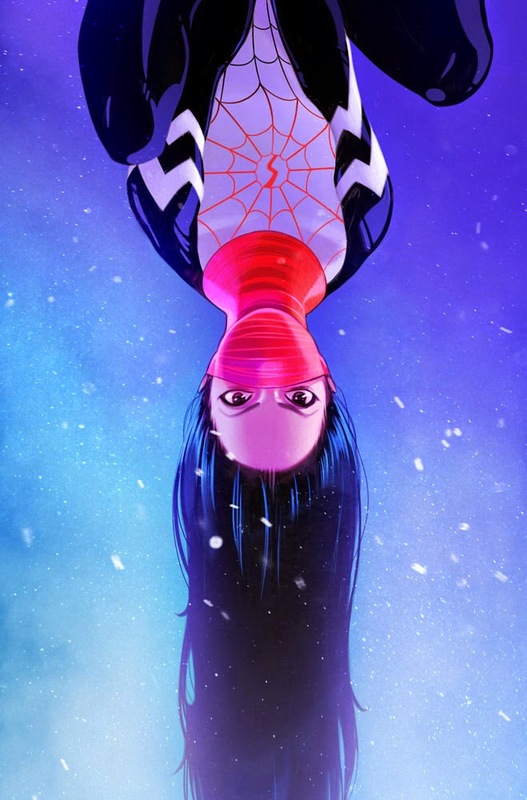 Finally, Marvel is putting out another new female-lead comic: Silk. This one will also be set in the Spiderverse, and will follow Cindy Moon, a woman bitten by the same radioactive spider that transformed Peter Parker. I don't know much more than that, but the art looks rad, and we can always use another WOC in our superhero world. Basically the gist I'm getting is that Marvel and DC have finally both wised up to how much of their audience really is made up of women. We're here, and we have money. At last they have noticed us! This boon of new Marvel titles comes on the heels of the success of Ms. Marvel, the creation of female Thor and Sam Wilson taking over Captain America, as well as Spiderwoman getting her own title. For DC, though, it's even more out of the blue. Granted, DC did just revamp its Batgirl comic, but aside from that there really hasn't been much to indicate that it's moving in a more progressive direction. Still waters run deep? I mean, historically DC has been much further behind on the diversity bandwagon, but it's nice to see them at least trying to catch up. So, the basic gist? Wonder Woman movie. Black Widow novel. So. Many. Lady. Comics. Numfar! Do the dance of ecstasy. Gonna make a prediction... While Marvel are ok with recasting parts, even major ones, when Chris Hemsworth decides he's had enough of playing Thor, he'll take the Asgardian throne and the hammer will go to Sif; but she'll stay Sif rather than becoming Thor. (I'd love to see an odd couple friendship between Sif and Darcy). Awesome. (I'd rather like to see Gamora get a solo movie too, along similar lines, involving Nebula, but I suspect the Guardians of the Galaxy won't get separate franchises). I'm actually most curious about what's going to happen when Chris Evans inevitably declares that he's done with being the center of the Marvel maelstrom. I'm hoping that the fact that Sam Wilson has taken over as Cap in the comics means that Anthony Mackie might take over int he movies. Or Sebastian Stan. Either answer is acceptable. I would *love* a Gamora standalone movie with tons of Nebula angst. Out of Sam and Bucky taking over as Cap, I think I'd prefer Bucky, because he's one of the Howling Commandos and has known Steve forever - he's a logical heir, and it would be a great capstone to coming back from being the Winter Soldier. On the other hand, Falcon is already an awesome identity. What I do want for Sam... Sooner or later, I'm guessing they're going to do the "in a moment of great need, someone else gets to wield Mjollnir" thing. And while it's probably going to be Steve, I think that's a waste, because it'd be one more accolade for the character already portrayed as a perfect hero. While instead, it could be a statement about heroism (Nat wields it, showing that true heroes exist even in the dark), promoting a formerly supporting character to the first division (Sif, Sam, or Rhodey wield it), or letting someone use it in a way that Thor can't (he needs it to fly, which means he can't really wield it while flying, but Sam could). So while I want Sif to inherit it, I want Sam to get to wield it in a moment of great need. Ok, sorry, bit of a tangent there. Yeah, Guardians of the Galaxy divided its "types of bestness" up quite widely (funniest/coolest/most heart-tugging/most heroic were all different things). But Gamora's relationship with Nebula was for me the most dramatic part. They've both lived surrounded by death, horror, and enemies, and I can't imagine that an upbringing by Thanos was a barrel of laughs in any other respect either. And they've both turned on him, but only Gamora's taken the extra step of turning against what he made of her. Each must see the other as a natural potential convert to their way of life (and it occurs to me how the only two other Marvel characters I'd say this about are Xavier and Magneto). We got to see this in Guardians, which is great, but there's so much further they could dig into it - but it would need a more serious touch than the next Guardians film is likely to have (or indeed should have). Great comparison between Gamora/Nebula and Xavier/Magneto. I think that's spot on. I hope the next GotG can delve into that. Because what really made the first one work was how it meshed the absolute hilarity with some genuine emotional pathos. I hope they can do that again. I hope they *want* to do it again.